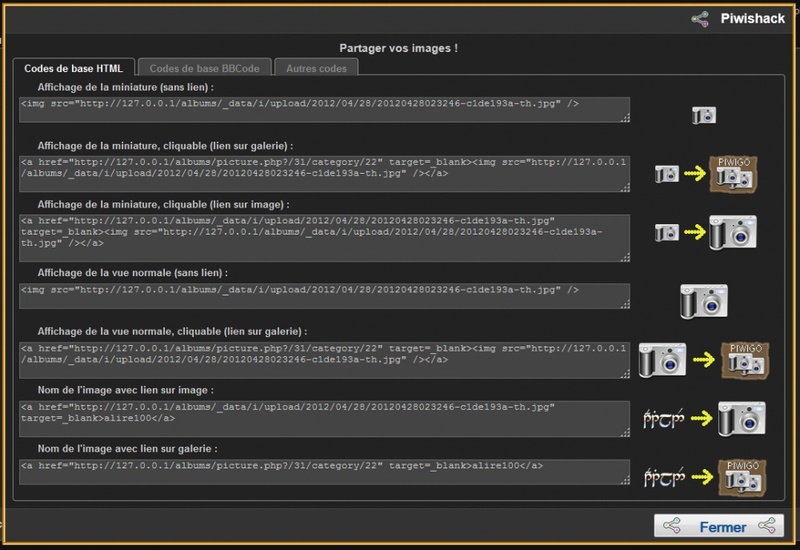 About: Piwishack provides codes for integration of thumbnails, images and/or links in a forum, a site or a blog. Codes are displayed in a popup window, with a sheet for HTML code, a sheet for BBcode and a sheet with specific codes (can be customised by the administrator). Ajout du Slovène (Slovensky) sk_SK. Correction d'un bug lors de l'affichage des liens PiwiShack sur la page des miniatures (thumnails.php). Ajout du Vietnamien (Merci beaucoup LadyFirst). Validation du Magyar sur PEM. [Bugtracker, bug 1800, fixed] Add icons in the pop-up. The thumbnail (link HTML) opens target in a new window.